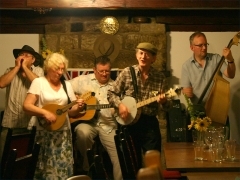 Bilsdale Folk nights start at 8pm on the third Sunday of each month September to May at the Jet Miners Inn, Great Broughton. Anything goes at Bilsdale Folk! Anyone can join in the very informal open floor sing-around sessions. There usually is a guest spot too and some very accomplished performers have already made their own contributions to Bilsdale Folk. Admission is free and everyone is welcome to come along and join in or just listen. The Jet Miners offers great food and excellent real ales. Black Sheep is a regular but there's usually guest ales as well. Come along for a great night's entertainment and a great atmosphere!